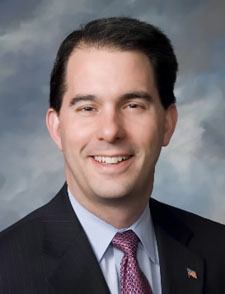 Wisconsin state legislator and county executive elected Governor in 2010, defeating Milwaukee Mayor Tom Barrett and succeeding Jim Doyle, who did not seek re-election. Conservative Republican; anti-abortion rights, anti-gay rights, pro-death penalty, pro-gun rights. Campaigned calling for smaller government, lower taxes, and reduced regulations. Upon taking office immediately cancelled federally-funded plans for a high-speed rail link from Madison and Milwaukee to Chicago, and backed legislation crippling public workers unions.